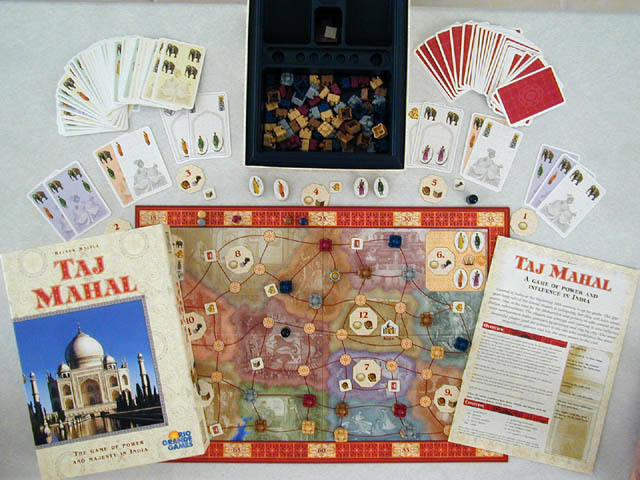 Taj Mahal , Reiner Knizia, Alea / Rio Grande Games, 2000. 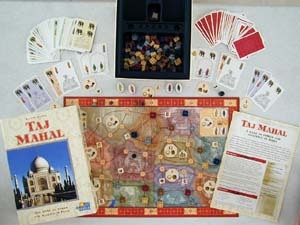 Taj Mahal is a board game set in 18th century India in which the battles are fought with cards. Like poker, in each hand a player must decide to "up the ante" and stay in the battle, or "fold" and exit. Players are vying for one or more of six tokens that are up for bidding. The tokens allow you to place palaces on the board, collect commodities, or score points in a number of different ways. Once all 12 regions have been visited, the player with the highest score wins. The cards form the basis for battling in this game. Players start the game with 6 cards each having one or two of the 6 token types on the card foreground. The cards have muted colored backgrounds of yellow, tan, blue, and green (21 each) which must be matched as you bid. There are also white background cards which optionally may be played with a colored card to form a two card bid. As the bidding goes round and round the table, players may continue to fight, or they may drop out. If you drop out, you individually count the tokens on your cards, and you win the tokens in which you have a plurality. At the end of your turn you select two replacement cards from a set of face up cards on the table. Thus, if on any turn you bid more than two cards, you are getting into deficit spending, and you will have fewer cards to bid in future rounds. On the other hand, you may simply skip the bidding, take a free card and your two replenishment cards to end your turn with no score and 3 more cards. At the end of the game, white cards and cards in your biggest suit score a point each. As you can see, card management is an essential part to winning this game. On each round, the Court of the Grand Moguls is stocked with 6 tokens. First a commodity tile is taken from the current province. A player winning this token will score one point for each of the 4 types of commodity on the tile. However, the commodity scoring is cumulative so if you already own 3 tea tokens, and this is your fourth, you will score a total of four points. If on the next round you win more tea, it will score a total of 5 points. Next the court is filled with one colored token for each faction: Vizier (green), General (purple), Monk (orange), Princess (yellow), and Grand Mogul (gold crown). Winning one of these tokens allows you to place a palace which scores you one point. However, the palace scoring is also cumulative, and you score one point for each connected region on the board. Thus, you first palace will score one point for the current region. If, however, on the fifth turn, it connects all five regions, it will score you five points. In addition, any two tokens of a single color will win you a special white card that adds to the power of your hand. Two Generals or Viziers wins you an extra elephant or mogul card. Two Princesses wins you a card that gains 2 victory points when played. Two Monks wins you a card that allows you to play any color card. In typical Reiner Knizia fashion, the methods of scoring seem very evenly balanced. Readers wanting more play details may read the rules at the Rio Grande games site. Let us now investigate some of the strategies of this game. Like any good game, there is no one strategy that will win the game. However, as was illuminated in lively Usenet discussions, there are several strategies which left unchecked will score a player a lot of points. Hoard cards: Because of the end game card scoring, there is the option to hoard cards and not bid. You start the game with 6 cards and may collect 3 cards on each turn that you not bid. Assuming you are lucky enough to collect your primary color or white cards, this leads to a maximum hand of 42 cards. Unfortunately there are only 21 cards in each suit color and 12 white cards lending a maximum score of 33 points. In the games we have played, the average score has been in the 35 to 50 point range. Even if you were able to pick up the 5 bonus card chits or the 4 white special cards, you would be unlikely to win with this strategy. Hoarding cards wins you points, but this alone will not win the game. Connect palaces: One strategy is to go for as many connected palaces as possible. If the tiles are sequentially distributed, this leads to a good chance of connecting and scoring early and often. Assuming each province connects to its predecessors, this leads to a maximum possible palace connectivity score of 78 points (1 + 2 + 3 + ... + 12). However, the initial random placement of the province tiles throws a fly in the ointment of this strategy. If the tiles are numerically scattered, the palace connectivity will yield far less than 78 points. If tiles 1 through 6 are disjoint and 7 through 12 are connected, your palaces will score a payoff late in the game. My advice is view the board at the beginning of the game. The connectivity of sequential numbers determines how much weight to give to this strategy. Hoard the Princesses: Many people like the special "+2" Princess card which scores you 2 victory points every time you play it. It takes 2 turns to initially win this card, but from there on in, you can score one point for each princess palace you place, and two for special princess card for a total of 30 points (10 rounds times 3 points). This is not enough to win the game, but the nice thing about this strategy is you can play it at the same time you play other strategies. You might also be lucky enough to win one of the 5 "+2" special bonus chits potentially getting 40 points with this strategy. Unfortunately, only 5 out of 21 cards in each suits have a yellow princess on them, so this is nearly impossible to follow the entire game. You also have the potential for even more considering the 5 extra commodity bonus chits scattered on the board. However, winning elephant battles will not win you a palace placement, and so the commodity bonus chits must be won with another token type. Also, there are 18 elephant symbols in each of the card suites and 7 elephant white cards. Since elephants are the most common symbol, expect many players to attempt to win the elephant battles. 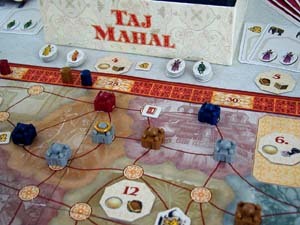 By this discussion you see there are many ways to score in Taj Mahal . Like life, others will compete for the same limited resources, and so your scoring will fall far short of these "perfect" strategies. Hopefully, you will pay attention to what others are doing and confound their plans while furthering your own. Also, notice that 3 player games will have more palace connectivity and more commodity scoring. Full compliments of 5 players will lead to less cumulative scores and lower scoring overall. Finally, let me mention that the production value of this game is top notch. The artwork by Franz Vohwinkel ( Big City , Ra , Vampire , Samurai ,...) is once again top notch, with card and region colors making it easy to identify categories. The graphics are crisp and clear, right down to the gold lame patterns on the silks of the royalty. The english rules translation is a style that works very well for me. Like Ra , Jay Tummelson has put the rules in two column format with in-depth explanation on the right, bold refresher rules on the left. This makes it easy for that inevitable refresher when you pull the game from the closet. The board is thick, but I've seen two that are slightly warped and don't lay flat. The palaces are a nice hard styrene plastic with excellent molded features. In summary, the production quality is the excellent high standard that you see in all the Alea games. 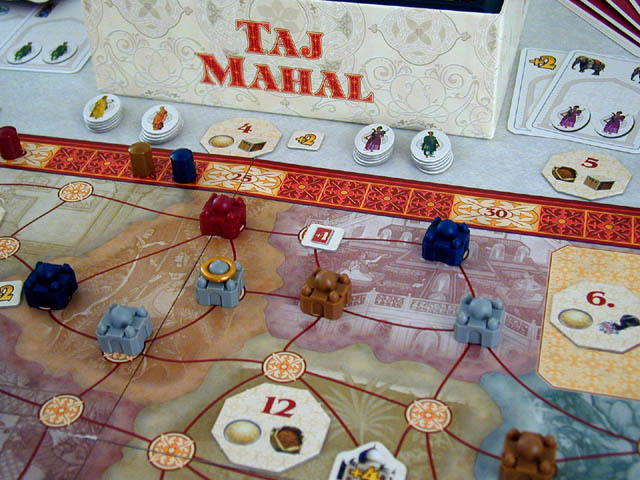 If you like poker or bidding games, you'll love Taj Mahal . After many games, I am still not tired of the tough battles that ensue from round to round. I'd like to think that I get better with more plays. but my recent trend on this game has been downhill. Perhaps that is due to luck or the rising skill level of my opponents. I don't know, but it something I hope to investigate in upcoming games. [an error occurred while processing this directive] Last modified: Thursday, 09-Jun-2011 12:37:06 MST.